Regional Fast Food Chains that should be Available Nationwide ! Best Regional Fast Food Chains that should be Available Nationwide ! The United States has an abundance of fast food chains that are found in every state. The likes of Burger King, McDonald’s, Taco Bell, and KFC are just a few of the notable chains available nationwide, yet there are some regional establishments we wish could expand throughout the country. A staple of the Midwest with more than 500 locations in the region, Culver’s offers traditional fast food fare that feels like a cut above so many national chains. Their burgers are the big winner here, known as butter burgers, these items are simply some of the freshest beef patties out there and you certainly tell by the taste. It may be helped by the generous helping of butter on the lightly toasted bun and a side of delicious crinkle cut fries, while you their unique frozen custard desserts is a must-try too. Bojangles’ is one of the best regional chains found in the Southeastern area of the country, reaching only as far North as Pennsylvania. Bojangles is under no illusions of its speciality dish, with fried chicken taking center stage on their menu. It’s easy to understand why they don’t focus on much else, as their fried chicken is some of the most succulent and flavorsome around. The secret Cajun seasoning gives it a unique spiciness that isn’t too overwhelming, while the breading always has the perfect amount of crunch. They know how to make a mouth-wateringly good biscuit too, which is the perfect way to compliment the delightful fried chicken. A favourite among west coasters, In-N-Out carries a somewhat cult following in California, where it is widely regarded as the best burger chain around. Not only are the burgers incredible, the prices are very affordable while the menu enjoys a range of classic fast food that hits the spot. The main reason for the lasting popularity is simple – freshness. In-N-Out doesn’t use microwaves or freezers, with all food supplies being freshly delivered. Unfortunately, this is the main reason it’s remain regional to mostly the west coast. Every restaurant must be within a day’s drive of either distribution centers located in Texas and California, making franchising unviable on a nationwide scale. Ask anyone in Texas what the best fast food chain is and you can expect most of them to say Whataburger. 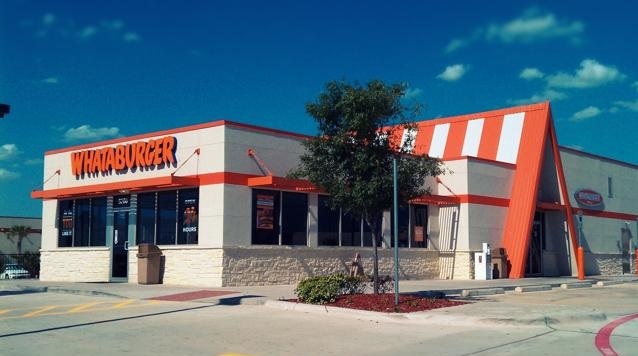 Today, Whataburger is mostly situated in the Lone Star State, with a few neighbouring regions also getting a few locations of their own. Enjoying a friendly rivalry with In-N-Out over who produces the best burger in the game, there is a lot to love about Whataburger’s menu. Their burgers, unsurprisingly, are the big seller. Huge beef patties are so freshly made they melt in your mouth, with a range of delectable toppings available. Their breakfast menu isn’t too bad either!